If you are looking a replacement following the new Lucozade formulation, Rapilose OGTT solution is one of two products recommended by Diabetes UK. Standardised to WHO guidelines, Rapilose delivers 75g of glucose in a 300ml ready-to-use solution. Each 300ml pouch of Rapilose OGTT Solution contains exactly 75g anhydrous glucose, which is the adult dose recommended by the World Health Organisation in oral glucose tolerance testing. Rapilose OGTT Solution is produced in a ready to drink format in a 300ml aluminium foil pouch with a tamper evident twist off cap. Rapilose OGTT Solution is a pleasant tasting orange flavoured drink that is non-carbonated and contains no colour additives. It is also gluten, lactose, fat, caffeine and alcohol free. Polycal® liquid (neutral or orange) is used in hospital setting. 113mL of Polycal® should be mixed with water to administer a total volume of 200 to 300 mL. (considerably cheaper than Rapilose® OGTT). obesity, with diagnosis of arterial disease or family history of diabetes. In such patients, it is useful to perform preliminary screening investigations i.e. random plasma glucose measurement and urinalysis for presence of glucose and ketones. The diagnosis of diabetes has important medical and legal implications for the patient. elevated haemoglobin A1c (HbA1c) result. The World Health Organization published revised guidelines on the diagnosis of diabetes, which were accepted for use by Diabetes UK from 1st June 2000. Severe symptoms i.e. vomiting and dehydration, urgent hospital admission is required. Milder symptoms and weight loss discuss patient urgently with the diabetes team for consideration of insulin therapy. An OGTT need only be considered to establish a diagnosis of diabetes if blood glucose values fall into an equivocal range (e.g. FPG >6.0 but an OGTT is not necessary if the diagnostic criteria for diabetes are present. Fast patient overnight (8-14 hours, water allowed) and rest during the test. Samples at times other than 0 and 2 hours are not necessary for diagnosis. For oral glucose tolerance testing, the standard dose for an adult is one pouch of Rapilose OGTT Solution (300ml/75g anhydrous glucose). However, it can be easily adjusted to paediatric applications based on body mass. The dose for children that weigh less than 43kg is 7ml (1.75g anhydrous glucose) per kg of body weight. The total cheldren’s dose should not exceed 75g. Treat co-existing coronary risk factors aggressively, as are at increased risk of developing cardiovascular disease. Colleagues may be aware of the debate about the potential use of HbA1c as a diagnostic test for Type 2 Diabetes. This has been featured in the medical literature, February 2013 edition of the Journal of the Royal College of General Practitioners. While there are some potential benefits, in particular in relation to convenience, there are also considerable risks and challenges with any such change away from the current standard diagnostic tests of serum glucose measurement +/- glucose tolerance testing (as per the algorithm in the Tayside Diabetes Handbook). There are significant numbers of situations where use of HbA1c as a diagnostic test is clinically inappropriate, leading to the risk of wrong diagnosis. All clinicians will need to carefully consider this list of ‘exclusions’ and ‘cautions’ whenever they wish to perform a diagnostic test. This is a clinical governance issue. The cost to the laboratories of an HbA1c measurement is up to 25 times greater than that of a serum glucose measurement. A change to the use of HbA1c as the diagnostic test of choice will therefore have major financial implications for Lab services. Work is ongoing at both local and National levels to work through these risks and issues. In the meantime, we would ask that colleagues continue to use blood glucose measurement +/- glucose tolerance testing as the routine diagnostic tests for Type 2 Diabetes. Dr Alistair Emslie-Smith, Lead Clinician, NHS Tayside Diabetes MCN. Dr Bill Bartlett, Joint Clinical Director Diagnostics, NHS Tayside. If patient has presented with osmotic symptoms (polyuria/polydipsia or weight loss) please follow specific guidance in Management of Newly Diagnosed Patients with Osmotic Symptoms. It has become apparent that the term ‘diabetes resolved’ is being used both within SCI-Diabetes and in Primary Care IT systems to code patients after pancreatic or islet cell transplants, or after successful bariatric surgery or other intensive weight reduction, where these treatments have begun to normalise hyperglycaemia. The ‘diabetes resolved’ code is also being used to ‘correct’ administrative errors, where a patient has been wrongly coded as having diabetes, and diagnostic errors, where a patient has been wrongly diagnosed as having diabetes and in patients with Gestational Diabetes whose post-partum glucose profile has returned to normal. All such patients, with a ‘diabetes resolved’ code on SCI-Diabetes, are AUTOMATICALLY REMOVED from the DRS retinal screening register. This is having the detrimental effect that some patients who DO require retinal screening fail to receive appropriate recall. 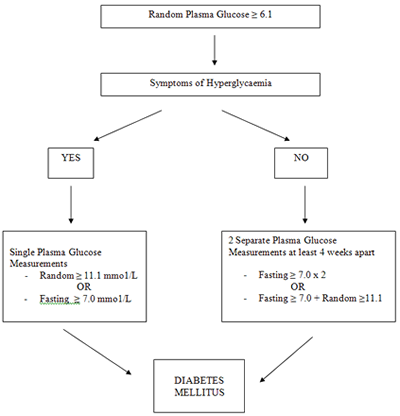 Abnormal glucose metabolism leading to hyperglycaemia defines the disease of diabetes mellitus, but hyperglycaemia exists on a continuum. The levels of fasting glucose (at or above 7mmol/l) and HbA1c (at or above 48 mmol/mol or 6.5%) that are used to define the diagnosis of diabetes are chosen because they are the levels associated with the diabetes specific complication of diabetic retinopathy. Levels of glucose below these diagnostic values but above “normal” levels (i.e. fasting glucose between 6-6.9mmol/l and HbA1c of 42-48 mmol/mol or 6-6.4%) have been defined to indicate people who are at increased risk of developing type 2 diabetes. 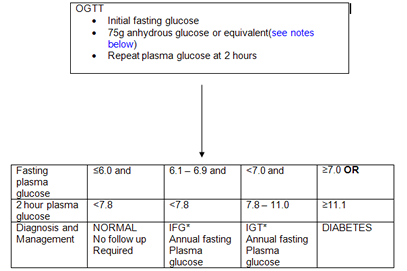 Levels of fasting glucose below 6mmol/l and HbA1c levels below 42 mmol/mol (6%) are defined as within the normal range. Successful management of diabetes with lifestyle and/or medication or transplant or bariatric surgery may result in glucose levels below those diagnostic of diabetes but, hitherto, it has not been clarified as to whether this should be termed good diabetes control, remission, resolution or cure? Very little scientific or actuarial evidence is available to guide this debate. A report from a group of diabetes experts, convened under the auspices of the American Diabetes Association, (ADA) was published in 2009 (Buse et al 2009) Consensus was difficult to achieve in some areas and the published recommendations are not the official position of the ADA. A very recent publication on the association of an intensive lifestyle intervention with remission of type 2 diabetes (Gregg et al 2012) uses the term remission. It suggests that an intensive lifestyle intervention may be associated with a partial diabetes remission in a subset of patients with type 2 diabetes, particularly those whose diabetes is of short duration, who have lower HbA1c levels at entry and who have substantial weight loss or fitness change.